Stepmills are one of the ways to do a cardio workout and it’s getting more and more popular at gyms across North America. The Stepmill workout is the same as climbing up the stairs, but using stepmill, you can set the speed, resistance level and use some handy features which vary from model to model. 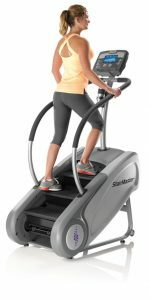 The most popular stepmills are Stairmaster stepmills. Stairmaster brand has the biggest part of stepmills and StairClimbers market. Unlike treadmills, stepmills is quite an expensive type of running machines and the cheapest new stepmills are about $2000-$2500 unless you buy used stepmill. In the list below, I’ve put stepmills and some Stairclimbers, because people sometimes want to get a Stairclimber, but they actually meant stepmills. 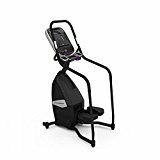 It happens due to a little information on the internet and some confusion articles you may read before buying a stepmill or a stairclimber. A stepmill looks like stairs powered by the motor of the machine while a stairclimber has two pedals that move independently. I also put Total Body Exerciser which can develop whole your body, not just only legs. What are the benefits of Stepmills? As other running machine, stepmill cardio increases your heart rate which affects a number of calories the workout burn. Training core muscle by maintaining body balance during the workout. A stepmill workout doesn’t hurt joints. There are some other stepmill benefits, but they are common to many cardio machines not only to stepmill machine. As I said in the introduction, the main stepmill brand is StairMaster and according to the reviews stepmill by stairmaster are quite good. There are also nautilus stepmills and life fitness stepmills, but it seems that they are not available for sale on amazon. There are lots of used stepmills for sale, especially used stairmaster stepmills. Before buying them, I recommend you to read this article. Even though it’s about used treadmills, it might be useful for any type of running machine.